All but Forgotten John J. Kiernan, was a pioneer in the financial news industry and the inventor of ticker tape news. Etched against the burgeoning lower Manhattan skyline, a lone figure rowed his tiny skiff toward the white-capped inner port. This was no fitness buff; his dark suit and bowler hat rose and dipped rhythmically from one ship to another, visits to each brief and businesslike. The year was 1868. The solitary oarsman was John J. Kiernan, an innovative pioneer in the field of financial news gathering. Today he is remembered for hiring Wall Street Journal founders Charles Henry Dow and William Davis Jones as early leg-men in his growing financial news bureau. Kiernan’s daily rowing missions allowed him to scavenge days-old newspapers from ships newly arrived from London and other distant ports. This information would be distilled into news items, then relayed by Kiernan and his messengers to Wall Street Financial News Bureau subscribers. Besides scanning news from overseas papers, Kiernan interviewed ship’s officers and well-informed businessmen on board. His office, soon known as “Kiernan’s Corner,” was located fittingly at Wall and Broad Street, site of today’s New York Stock Exchange. Hiring Dow and Jones in 1880 was at once a stroke of genius, and a source of future regret, for the 35-year-old Brooklyn-born entrepreneur. The eldest of six children of Irish immigrants Frank and Ellen Kiernan, John J. was born in Brooklyn on February 1, 1845. Armed with only a grade school education, he found work as a lad of 12 running errands for the Magnetic Telegraph Company, later becoming a Western Union messenger. While delivering dispatches in the financial district, Kiernan quickly saw the value businessmen put upon his service. They snapped up Kiernan’s messages and offered money for other news coming across the wires. Using his own small savings and borrowing from friends and family, Kiernan decided to launch his own news business in 1869. Subscribers to Kiernan’s News Agency paid $300 per month for late-breaking news items in the shipping, rail-road and construction fields, as well as other financial information. Bell Telephone would not be created until 1877, a dozen years after the Civil War. Thus news-gathering was conducted largely on a face-to-face basis. Shoe leather and salesmanship were often key to coaxing items from often reluctant financiers, shipping and manufacturing moguls. As his financial news agency prospered, thanks, in part, to hard work and long hours from Dow and Jones, Kiernan was free to turn his attention to politics. As a Democrat, he won two terms as a state senator, beginning in 1881, and is credited with authoring bills to improve New York Harbor and its ferry service. Kiernan’s proudest moment may have come in 1880 during Charles Stewart Parnell’s visit to America. The senator-to-be escorted Ireland’s leading home-rule advocate through Wall Street and into the Stock Exchange. There, Parnell was introduced to financial movers and shakers, many of whom were friends of Kiernan. His plea for “subscriptions” to improve living conditions among Ireland’s distressed tenant farmers won great support. While their employer turned his attention to politics, Dow and Jones saw their chance. They abandoned “Kiernan’s Corner,” and launched their own financial sheet in 1882. In the basement of a candy store at 15 Wall Street, they began publishing a Customer’s Afternoon Letter. In little more than a year, they had 1,000 customers. Eventually, the newsletter became the Wall Street Journal. Kiernan saw his news bureau slowly decline. He brought in William P. Sullivan as a partner, but they quarreled privately, in print, and finally in court. In 1888 Sullivan bought the Kiernan News Agency for what the New York Times said was “a few thousand dollars.” No longer a senator and stripped of his agency, Kiernan, was anxious to regain a measure of his old political clout. He was honored by leading political figures, from ward through federal levels, at a testimonial dinner in July, 1883. However, Kiernan’s dreams of future glory weren’t to be. What the doctors had said was a heavy cold developed into pneumonia and heart failure. 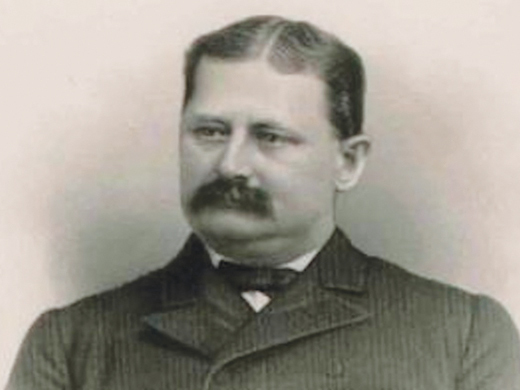 On November 29, 1893, John J. Kiernan, at the young age of 48, died on his Brooklyn home.